You are here: Home / Uncategorized / What Happened at the December 2018 Meeting? The Tasman District Council has funding in this year’s budget to redevelop the playground at Mapua Recreation Reserve next to the tennis courts. This funding was approved through the Annual Plan process. The current play structure is due for replacement and the TDC sought feedback in December and January via community survey as to a new design and equipment. Glenn Thorn, the TDC’s Reserves and Assets Project Officer who is leading the redevelopment, presented his preliminary thoughts at the December 10 meeting of the Mapua & Districts Community Association. Glenn stated he has a $153,000 budget which includes costs for removal of existing play equipment (expected to be subsequently sold rather than donated). 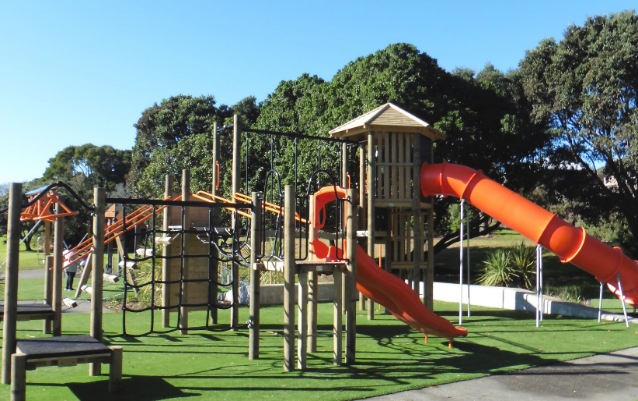 By comparison, about $120 000 was spent on the new Takaka playground. The thought is for the new playground to have a similar footprint as the current play area, perhaps with a bit of extension to make maintenance easier and provide more seating under shade. The TDC design team is not a big fan of fencing, rather they prefer to strategically place furniture to form a natural barrier and create safe zones. And through zones, strategically place equipment to cater for all ages. There is value in cross playing (big kids with smaller kids) but there’s a skill to how that is integrated. Glenn has found that consultation with children has been important, with the best ideas coming from those kids using the playground and not necessarily parents or caregivers. He stated that it’s more cost effective for the TDC to import already designed and safety approved equipment saving the council fees as it won’t require building permits, etc. Glenn has been collating the recent collected surveys and will return to the community once he has 2-3 concepts to further discuss and get approval. He expects to require 12 weeks to source equipment and hopes to have a new playground in place in mid-winter. The finished surface of this path is acknowledged as being less than ideal for cyclists. This is an outcome of the low cost nature of the project, which was necessary to get it built in the first place. However, after it has settled we propose to redress the top surface with a material which will provide a better running surface. We expect this work to be carried out in the first half of 2019. In the meantime the path fulfils its initial function as a safe pedestrian path. I am following up with our consents and compliance team regarding whether the developer of the sections fronting Mapua Drive (numbers 75-95) has complied with the consent conditions regarding landscaping. I understand there was a requirement for flowering pear trees to be planted with an ongoing requirement for property owners to landscape their frontages. We will let you know the outcome. This proposed new footpath is included in the Council’s list of proposed new footpaths to construct. This list is extensive and the projects on it are prioritised to provide maximum benefit from limited available funds. At this stage, unless additional funding is made available to us, this site will not have funding available for it for a couple of years. We are investigating lower-cost options to enable a safe separated path to be created. We hope to have more detail on this shortly. We are aware of the communities’ desire for a refuge. The current subdivision [opposite the Village Mall] will not impact the proposal to any degree, although they are forming a footpath along their Aranui Road frontage which will leave a relatively short length on the southern side of Aranui Road for the Council to form to complete the link along to the existing crossing point. Constructing a central refuge would result in the loss of the existing on-street mobility park outside the health centre. We have not consulted the community or mobility park users about this yet, but would be interested to know from yourself and MDCA how the community would feel about the loss of this park. There is an alternative option of constructing a kerb buildout on the northern side of Aranui Road without a central refuge island, which would shorten the crossing length from 10m to 7.5m, and retain the carpark. We would welcome feedback from MDCA on these two options. We are currently preparing a shortlist of sites for consideration of speed limit reviews. Investigation of these sites is happening now and we will include investigation of Aranui Road. … A bigger question I would ask through MDCA is how the community would feel about a wider speed limit change? There are only two ways into Mapua village, Aranui Road and Higgs Road, and it would arguably make sense for a 40km/h ‘gateway’ to be established somewhere on these roads and for 40km/h to then apply to all residential streets within the main village area. Otherwise, just considering Aranui Road could mean that ‘50’ signs would need to be erected on side roads (Toru St, Higgs Rd, Langford Drive, Tahi St and Iwa St). Concern was expressed regarding the lack of a toilet at the Rabbit Island waiting area for the Mapua Ferry. Councillor Tim King mentioned toilet facilities had been suggested on various occasions with the challenge being there are 100km of the Great Taste trail and where do you begin? Tim suggested that businesses approach or apply for funding from TDC. Further concerns were mentioned about building toilets on a dune and the huge challenges it would face with iwi since the cultural significance of the area being a historical fishing village site. It was resolved to do further research then write the cycle trail trust to inquire about their plans. It was noted in a recent household growth report that Mapua has and will continue to have one of the largest growth rates in the Tasman District. Below is the “high” version of the estimates. All statistical data are subject to error. Be sure to attend our next monthly meeting: Monday, 11 February at 7 PM, Mapua Hall. MDCA works closely with TDC to ensure our community functions in a way that suits the majority of our residents. To have a vote that counts, become a financial member of MDCA by simply paying a $10 membership fee to our NBS account 03-1354-0356471-00 with your name & phone number as a reference.